If you think you don't need a tree topper, wait until you set up your Christmas tree and realize it looks bare without one. Consider getting one of the best tree toppers to use, which is the snowman head. A snowman is an iconic character that's synonymous with the winter holidays. This may be surprising to you but snowman head tree toppers come in many varieties. If you want something that becomes the highlight of the Christmas tree, then you can easily find a tree topper that is large, bright, and festive. If you want something that is more laid back and capable of giving your living spaces a more casual vibe, then you’ll love the selection the market has to offer when it comes to modern snowman tree toppers. Of course, the abundance of choices can be a cause for confusion. Hence, this article is going to feature eight of the best snowman head tree toppers. This product is a snowman tree topper that uses a clip mechanism, which allows for convenient functionality. The ornament is primarily made from fabric, so it's more durable compared to the common ones made from Styrofoam. 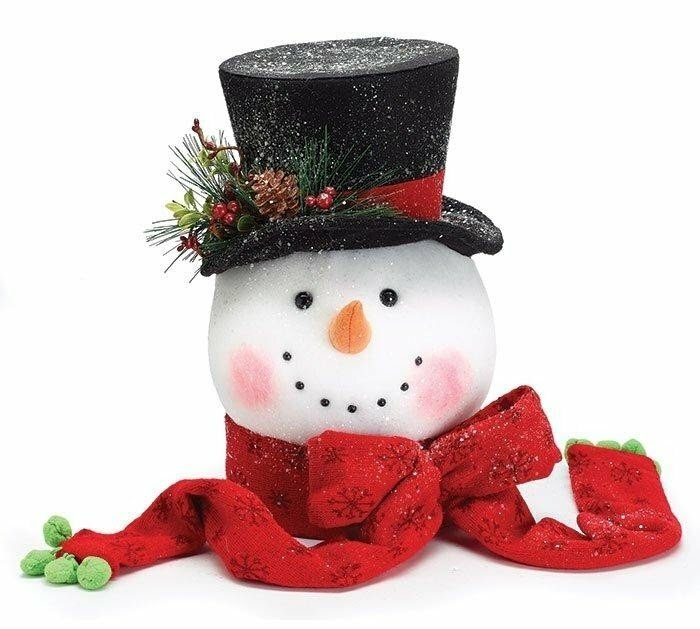 The ornament features a snowman head with a stylish black hat with a red trim. The hat is also decorated with pines and cones to help bring out that festive atmosphere. The snowman is not without a celebratory red scarf. The product comes with two ornamental snowmen for you to use. If you want to add a pop to your Christmas tree, then this snowman head topper is ready for the job. This snowman features a black hat with an orange nose. The addition of the rosy cheeks is also adorable. One thing that makes this tree topper a novel is the scarf that comes along with it. The scarf is in bright red, and it dangles for about 15 inches. Imagine allowing this iconic snowman to sit on top of the Christmas tree and let that scarf drop elegantly. It's definitely an icing on the cake. This one’s a snowman topper for shoppers who are not satisfied with just a Christmas decor sitting on top of the tree. This relatively large tree topper features a snowman that appears to hug the Christmas tree, and it comes with a big smile to go along with it. It's not only eye-catching, but it's also heartwarming at the same time. The snowman is around 15 inches in height with a scarf that extends 45 inches down. The hugging arms are approximately 20 inches in length. This snowman topper works well for a small to medium sized Christmas tree. Otherwise, the size of the tree could make it look disproportionately small. The snowman topper is extra glittery. It comes with a fashionable black hat and a bright red nose. Of course, you can't miss the big smile of the snowman. The item is primarily crafted from polyester fabric. On the inside, foam is used to help the snowman retain its form. The fifth product on our list is a snowman topper that's an excellent choice if you want to keep the industrial, rustic or farm-inspired charm of your interior design as it comes with a distressed style. The snowman comes with long arms that will appear hugging the Christmas tree once fixed into place. Also, it comes with a unique-looking hat. The product is crafted from a mix of wood, metal, and fabric. Hence, it's more durable compared to other snowman tree toppers in the market. The snowman is around 8 inches in height, and the hugging arms are about 25 inches long. This item is the perfect choice if you want a snowman topper that comes with a vertically elongated profile. Because of its design, it can help make your Christmas tree appear taller than it really is. Apart from the long black hat, the snowman also comes with a bright orange nose. It also features a long flowing scarf with the signature holiday colors of red, green, and white. The snowman is primarily crafted from polyester, making it an excellent choice if the budget is a bit tight. It stands around 14 inches and it’s 12 inches wide. It can work as a hanging ornament aside from being a tree topper. This one here’s a snowman tree topper that is unique in appearance. It comes with a distressed feel, making it perfect for that rustic charm setting. The nose is also in brown rather than the typical stout red or orange. Perhaps the most significant difference with this item from all other snowman tree toppers is it comes with a maroon-colored ski hat. It's stylishly different as most will feature black hats. Aside from being a topper, it's also a hugger. It comes with long arms that are designed to hug the Christmas tree. The head is 4 inches in diameter, and the arms are 20 inches long. It's mainly crafted with fabric with accents made of wood and metal. If you or the kids are fond of Disney characters, then you'll hardly find any other tree topper that's better than this item. This tree features a massive star and Santa's sleigh complete with reindeers. You'll find the popular Disney characters in the sleigh. The sleigh "hangs" through a wire that's connected to the top of the bright star. If you think this is an impressive setup, wait until you flip on the "on" switch. Once switched on, the star will start to glow brightly. On top of that, the sleigh will begin revolving around the star slowly. Not only are the characters fun and iconic, but this tree topper is also made to impress with its brightness and animated sequence.